All 141 rooms at the newly renovated Courtyard by Marriott Virginia Beach Oceanfront South hotel have an oceanfront view with private balcony. The rooms feature free Wi-Fi, HD television, mini-fridges, coffee, and new plush bedding. Suites have microwaves and wet bars. Their new Bistro cafe is a nice place to enjoy a meal with an ocean view. The Courtyard Marriott Ocean South Hotel's other amenities include an indoor pool, hot tub and fitness center. Banquet and meeting rooms are available for groups. 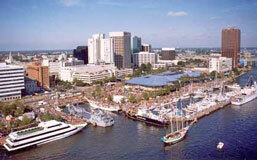 This is a modern Virginia Beach hotel with many fine features. 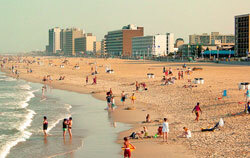 The hotel is located in Virginia Beach, Virginia on the oceanfront, at 2501 Atlantic Avenue. Map. It's in the middle of all the restaurants and shops on the "strip".